N8000XXUDNE4 Android 4.4.2 KitKat Firmware Last Updated on 30-May-2014. 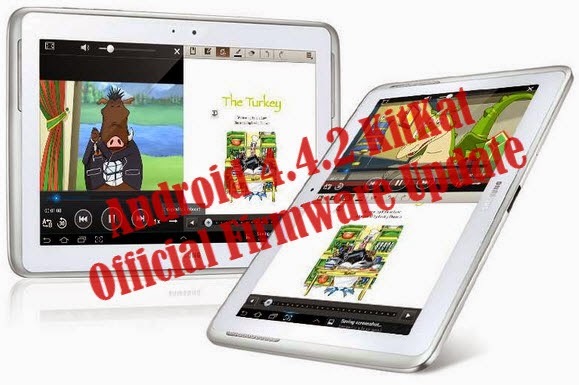 Samsung Galaxy Note 10.1 GT-N8000 recently received the latest XXUDNE4 Android 4.4.2 KitKat official firmware update. Samsung recently rolled out an OTA update about the firmware. The latest firmware build version number is N8000XXUDNE4. However, the firmware is currently released for Germany. Hope the firmware will hit other part of the world soon. The Galaxy Note 10.1 N8000 was released with Android 4.0.4 ICS and receiving Android 4.1.2 Jelly Bean from a long. This is the first official android 4.4.2 KitKat firmware update for GT-N8000. If you own the device and not yet updated this latest firmware, then do it now by using our simple tutorial below. The below guide will help you to download and install the N8000XXUDNE4 Android 4.4.2 KitKat Firmware manually through Odin. If you already updated the N8000XXUDNE4 firmware and looking for an easy to follow method to root the firmware, then follow this guide- Root N8000XXUDNE4 Android 4.4.2 Stock Firmware On Galaxy Note 10.1 GT-N8000- Simple Tutorial. The latest Android 4.4.2 KitKat is definitely a great update for the Galaxy Note 10.1 GT-N8000 users. The latest firmware will upgrade the OS version to 4.4.2 KitKat and will bring many new features and performance tweaks. So, want to update your Galaxy Note 10.1 N8000 to the latest XXUDNE4 Android 4.4.2 KitKat firmware? For official way, either you can go for OTA (over the air) from Settings-About Tablet-Software Update or download firmware through the Samsung Kies utility. However, if you are looking for a manual way to update the latest Android 4.4.2 XXUDNE4 firmware on your Galaxy Note 10.1 N8000 through Odin then follow the step by step manual update guide below. "The firmware is released only for the Samsung Galaxy Note 10.1 GT-N8000 model, so don’t try this in any other android device. Check your device model number from Settings-About Tablet. Also the tutorial is based on Windows PC. Follow all the pre-requisites, procedures and steps carefully to avoid breaking your Tablet". Samsung rolled out the firmware for the following countries. The firmware which are unbranded or not locked to any carrier, no matter of which country or region, can be flashed on any Galaxy Note 10.1 GT-N8000 model. All the above pre-requisites are very important and must follow before proceed to installation guide. Hope you get all the above points. Now, go through the below tutorial to install Android 4.4.2 N8000XXUDNE4 official firmware on Galaxy Note 10.1 N8000. Switch off your Tablet and boot Galaxy Note 10.1 N8000 into Download Mode by pressing and holding the Volume Down and Power keys together until you get the warning message, now press Volume Up key to proceed to Download Mode..
Congrats! Your Galaxy Note 10.1 N8000 is ready now with the latest available firmware. Hope you successfully update XXUDNE4 Android 4.4.2 KitKat official firmware on Galaxy Note 10.1 GT-N8000. If you followed everything as mentioned in the above tutorial, then your device should now running on the latest Android 4.4.2 KitKat build version XXUDNE4. You can verify the firmware update details from Settings-About Tablet. For any queries feel free to contact with us any time and don’t forget to share your experience in the comment below. This German firmware can only works for the European devices? Or can other device from different region use this firmware too? I using Asian device and i just upgrade to German firmware,everything working fine so far. N8000 from Thailand is Working fine in this firmware. Can SOMEONE just put the damn fimware on line WITHOUT having to Join some sammobile or other pay for premium download .WTF must everyone make money, if it will be offered to ALL very soon ??? I agree, its a mission to find the firmware without having to go to a whole bunch of arb places that dump all sorts of deamomware on your pc.